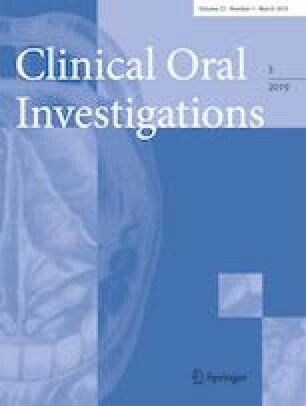 To compare the dimensions of maxillary sinuses in dentate and edentulous patients using cone beam computed tomography (CBCT) scans and a customised software program. This study comprised CBCTs of 50 dentate and 50 edentulous posterior maxillae. The observers drew two planar curves in all included sinuses in the frontal, sagittal and axial planes of the respective CBCT scans. The volume (mm3), surface (mm2) and maximum diameter (mm) of the sinuses were calculated using a custom-made software program. The variables analysed were the influence of the state of dentition on sinus dimensions (primary outcome) and the influence of age, gender and side on sinus dimensions; the time needed for analysis; and the intra- and inter-observer agreement (secondary outcomes). There was no difference in sinus dimensions between dentate and edentulous posterior maxillae. Males had significantly (p < 0.05) greater volume, surface and diameter than females. Strong intra- and inter-observer agreement (Pearson correlation) was found for the calculated sinus dimensions. The time needed per analysis was less than 4 min for both observers. Being edentulous did not have an impact on the sinus dimensions, suggesting that there is no ongoing pneumatisation in the sinus after tooth loss. Males had larger sinuses than females in a population older than 30 years. Following tooth loss in the posterior maxilla, vertical bone height is primarily lost due to resorption of the alveolar crest, and not due to pneumatisation of the maxillary sinus. The customised software program was found to be user-friendly and efficient. Martina Schriber and Michael M. Bornstein contributed equally to this work. The authors thank M. Gabriel Fischer, significantis GmbH, Herzwil b. Köniz, Switzerland, for his assistance with the statistical analysis. This study was funded by a grant from the Swiss Association of Dentomaxillofacial Radiology (grant number 15/01). This study was reviewed and approved by the local ethics committee of the State of Bern, Switzerland (approval number 384/14). All procedures in this retrospective study were conducted in accordance with the Declaration of Helsinki (1964) and its later amendments.